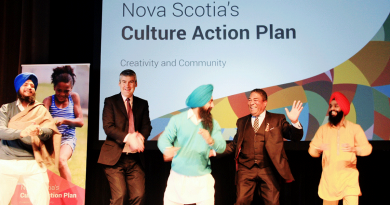 Stephen McNeil and Minister of Communities, Culture & Heritage Tony Ince held a big event yesterday to announce their new Culture Action Plan. McNeil danced (literally, and then figuratively when he spoke), and Ince talked about his commitment to culture, a speech that stood in stark contrast to the silence that he maintained when McNeil and Diana Whalen blew up the Nova Scotia film and television industry in April 2015. The cultural bureaucrats in the private sector predictably lined up and said it was all a wonderful thing, because they never want to offend or call into question the government that provides them with much of their operating funds, and everyone went home happy. Well, here’s the thing. We’ve heard this all before from the McNeil government. Freeman, Ivany, Broten… reports have come with great fanfare and commitment to change, and then they get circular filed. Anyone who would trust the McNeil government to follow through on any of the cultural “action plan” almost deserves the inevitable disappointment that we have seen with these reports so many times before. Oh, sure, it sounds good, just like all of these reports do – bureaucrats and their enablers have it down to a science when it comes to writing these things. But what does it really all mean? The “value of culture” stuff is easy to write, probably because it’s been written many times before. I’ve seen this language for twenty years, both during my time in government in the late 1990s and in the years since. There’s an art to it, ironically, but it doesn’t mean anything. They’re just words, and words are a dime a dozen, especially with the McNeil government. Where are the actual plans? You know, things like specific new budgetary provisions, or real programs, or success measurement benchmarks and matrices. Those kinds of things, which are what you’ll find in an actual plan, are missing. Dan Dare Takes Off Once More!